The summer months make me think of making home-made ice cream, which can be a real treat. I will highlight several styles of ice cream that can be made at home, ranging from simple to more complex. The great thing is that even the simple ones are really good, made with fresh ingredients, and so much better than store-bought. Typically, a flavored ice cream base is made and then chilled and then churned in a pre-frozen ice cream maker. The churning allows for the formation of tiny ice crystals and pockets of air surrounded by thick, concentrated cream, leading to the smooth and creamy texture associated with ice cream. There are many types of ice cream makers out there. I own an ice cream maker attachment for my KitchenAid Mixer. 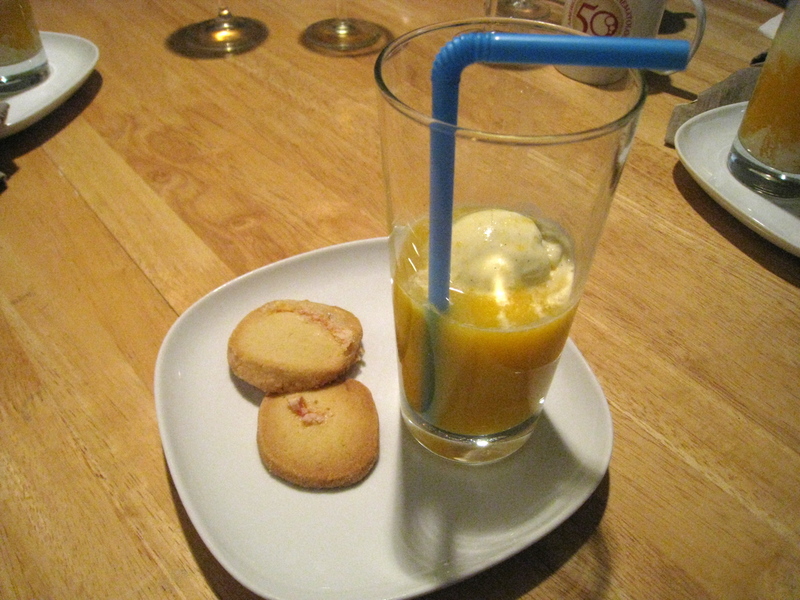 The bowl is pre-chilled in the freezer overnight and then a plastic dasher attaches to the mixer to churn the ice cream. 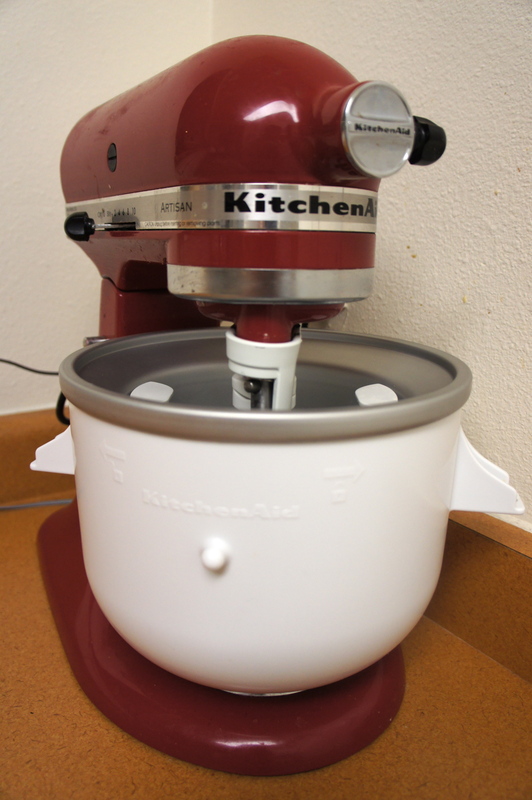 I have also used stand-alone ice cream makers, such as the Cuisinart Ice Cream Maker. With the Cuisinart there is a bowl that is placed in the freezer, and then the bowl is rotated within the machine to churn the ice cream. 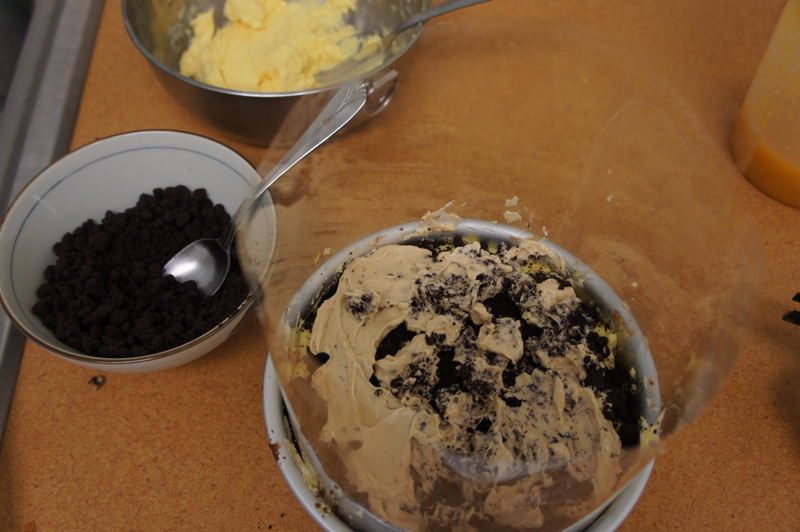 After churning, the ice cream is then placed in the freezer to harden for a couple hours. However, a super-easy ice cream to start out with is No-Cook Strawberry Ice Cream, from Gourmet magazine. 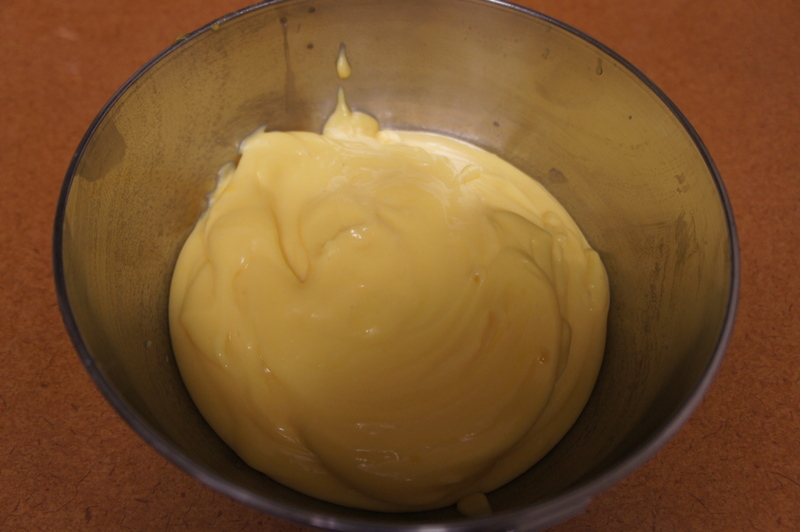 As the name implies, there is no cooking of a traditional custard ice cream base. 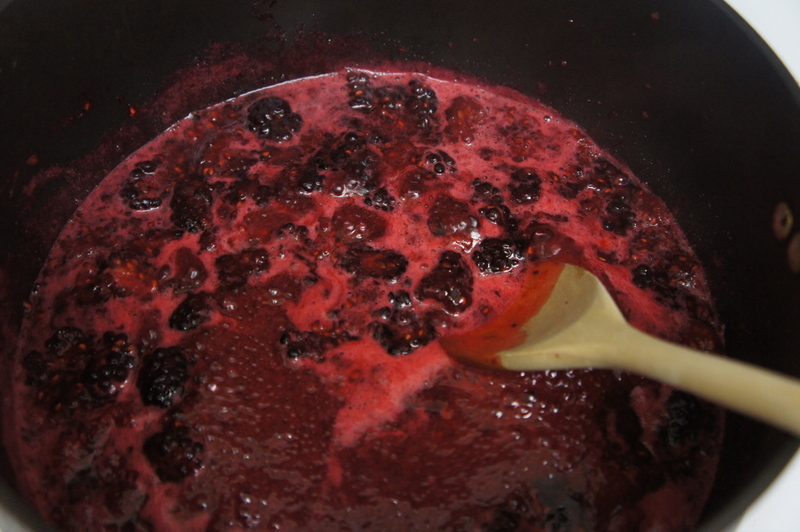 Instead, mashed strawberries, a little bit of lemon juice, sugar, salt, and heavy cream form the base, half of which is pureed in a blender to smoothen, and the entire mix is then spun in the ice cream maker. Really easy and really delicious fresh strawberry flavor. 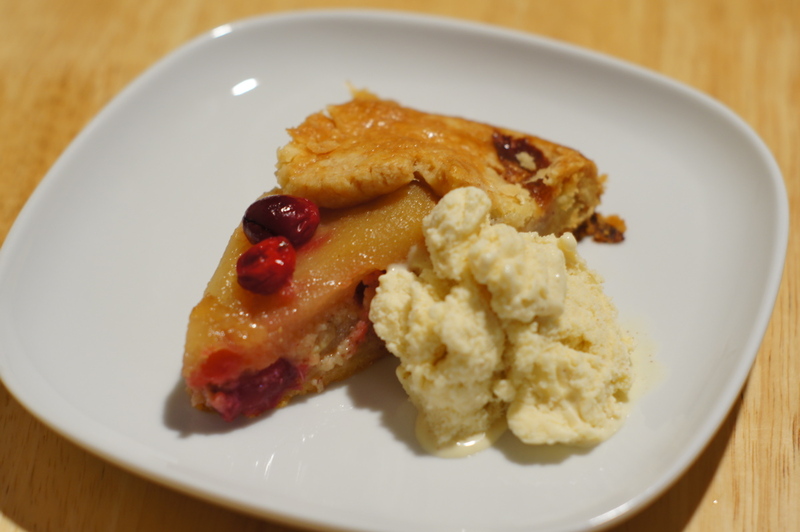 A bit more difficult is Sour Cream Ice Cream, also from Gourmet magazine. It might sound strange, but the tartness of the sour cream works really well as an ice cream flavor. 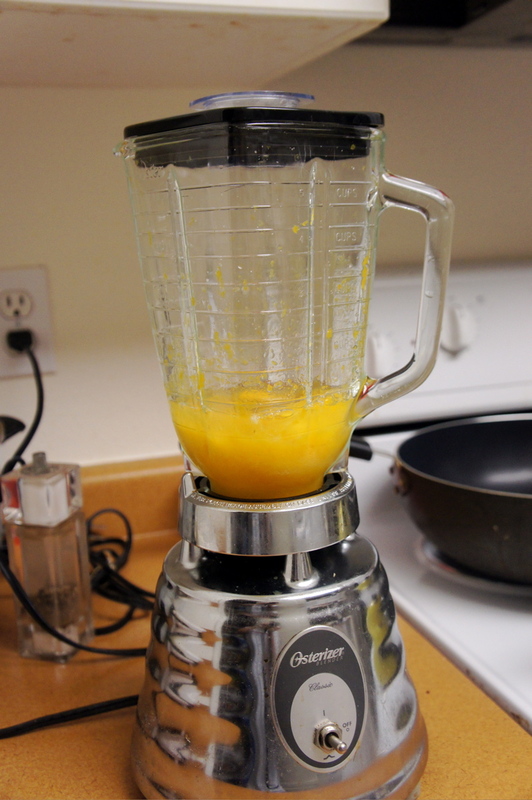 This one does require making a cream and egg yolk custard. 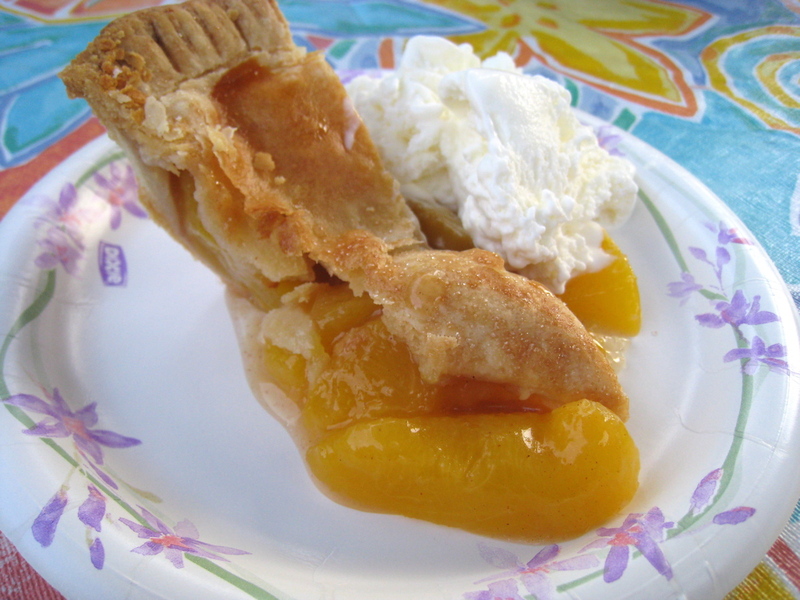 The Sour Cream Ice Cream goes wonderfully with Honey Caramel Peach Pie. A little bit more complex ice cream, but one that does not require egg yolks is Sweet Corn and Black Raspberry Ice Cream. I first saw this published in The New York Times as an excerpt from the book Jeni’s Splendid Ice Creams at Home, from Jeni Britton Bauer’s famous shop in Columbus, OH. 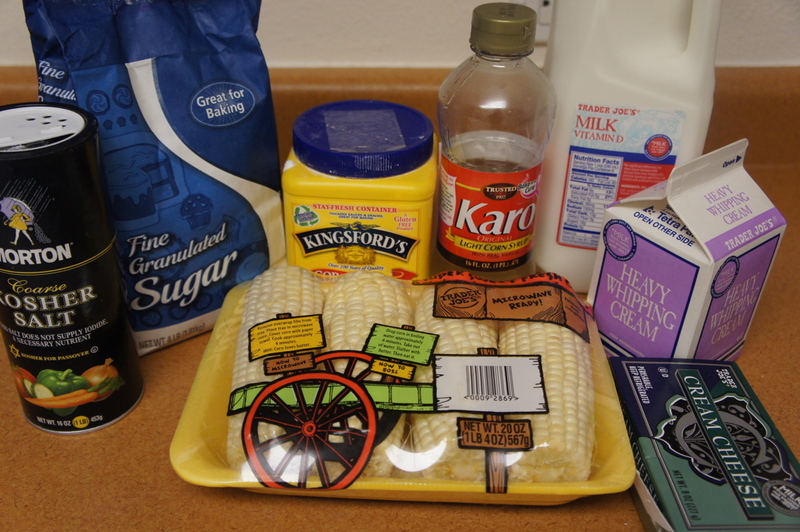 Her base is non-traditional and includes corn syrup, cornstarch, and cream cheese. 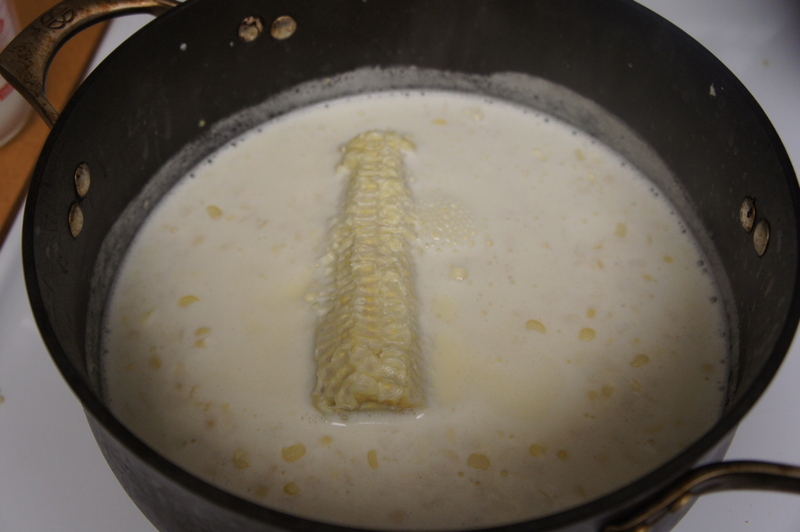 Milk, heavy cream, and sugar are heated together with freshly shucked corn kernels as well as the spent corn cob. 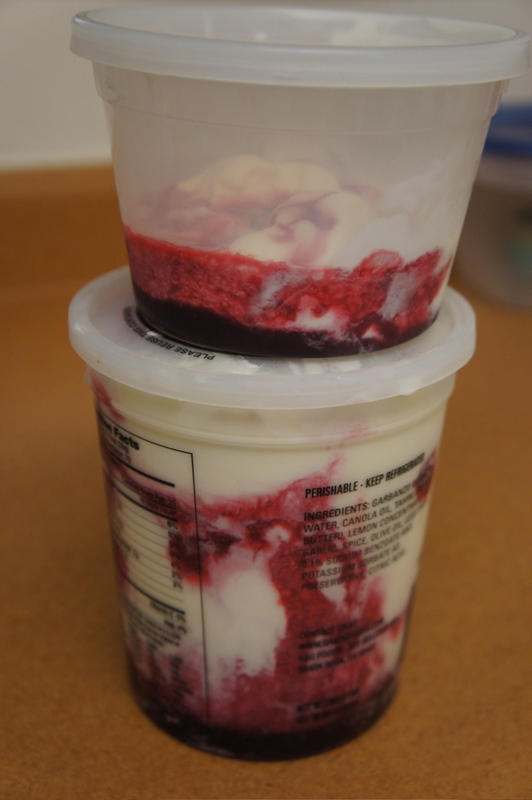 The base is thickened with cornstarch slurry, then strained, mixed with cream cheese, chilled, and spun in the ice cream maker. 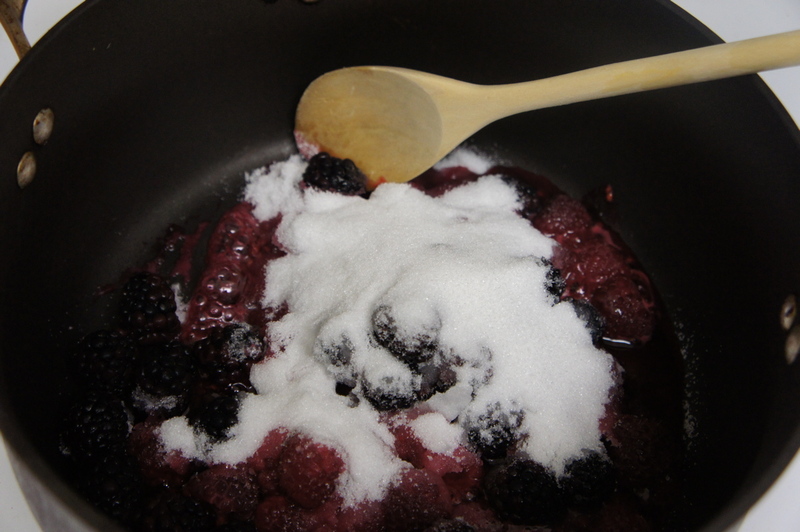 The ice cream is layered with a black raspberry syrup cooked down from fresh berries and sugar. 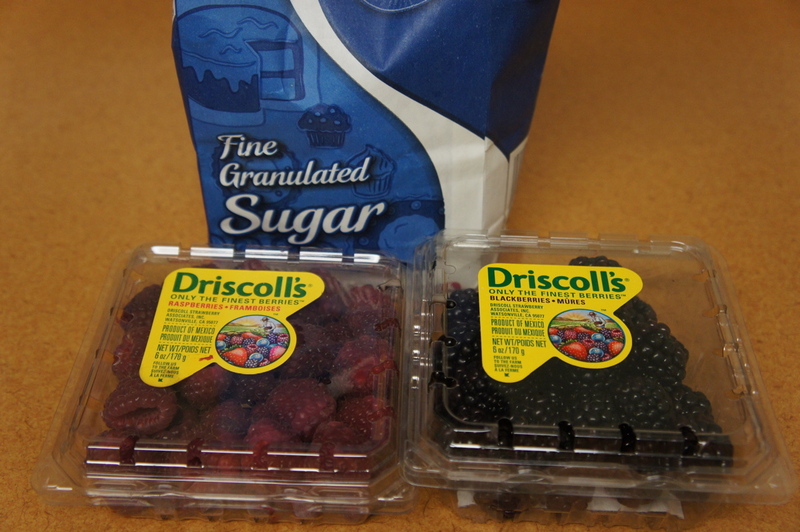 Black raspberries are hard to source, and I substituted 1/2 blackberries and 1/2 raspberries instead. This is a really great and unexpected flavor combination and perfect to make in the summertime with fresh corn and berries. Christina Tosi at Momofuku Milk Bar uses sheet gelatin to stabilize her ice cream base, and again no eggs are needed. I have made the Graham Ice Cream, and there are many other unique recipes in the Momofuku Milk Bar cookbook like Cereal Milk Ice Cream and Red Velvet Ice Cream. A little more complicated but worth doing for the unique flavors. Finally, Joanne Chang’s Honey-Cinnamon Ice Cream, from her Flour cookbook, is really rich and sophisticated. It is made with a traditional custard ice cream base (heavy cream, egg yolks), with the delicious combination of honey and cinnamon. Really good paired with a fall dessert like her Roasted Pear and Cranberry Crostata. Try an easy recipe or try a harder recipe, but hopefully you will be convinced to go out and make your own ice cream! Link to No-Cook Strawberry Ice Cream recipe here. Link to Sour Cream Ice Cream recipe here. Link to Sweet Corn and Black Raspberry Ice Cream recipe here. Link to Honey Cinnamon Ice Cream recipe here. 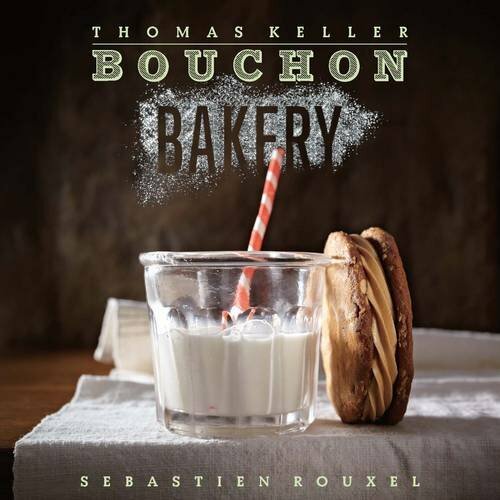 October 23, 2012…just in time for Christmas or a belated birthday gift (hint, hint)…I will definitely be making recipes from this book when it arrives! Link to Michael Ruhlman’s website about the making of the book here. These brownies have a secret ingredient. Have you seen the movie The Help? I keed, I keed. The secret ingredient is black beans, which makes these brownies “healthy” (sigh). 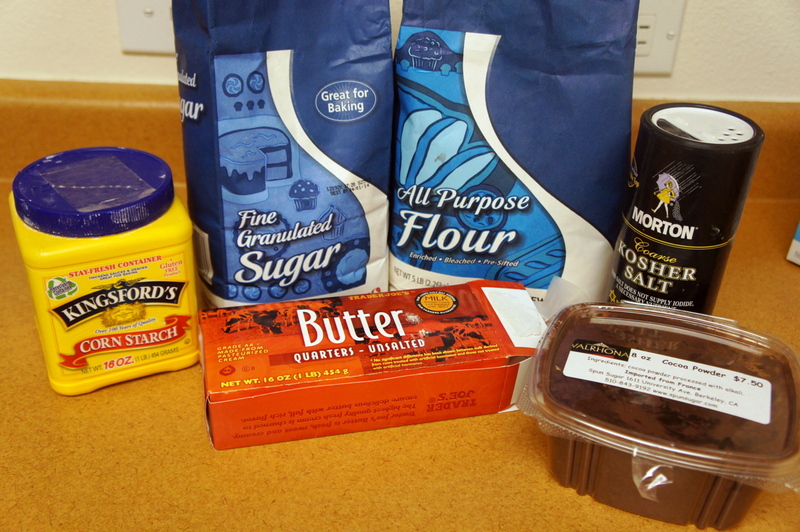 The black beans substitute for flour, making these brownies also “gluten-free” (double-sigh). 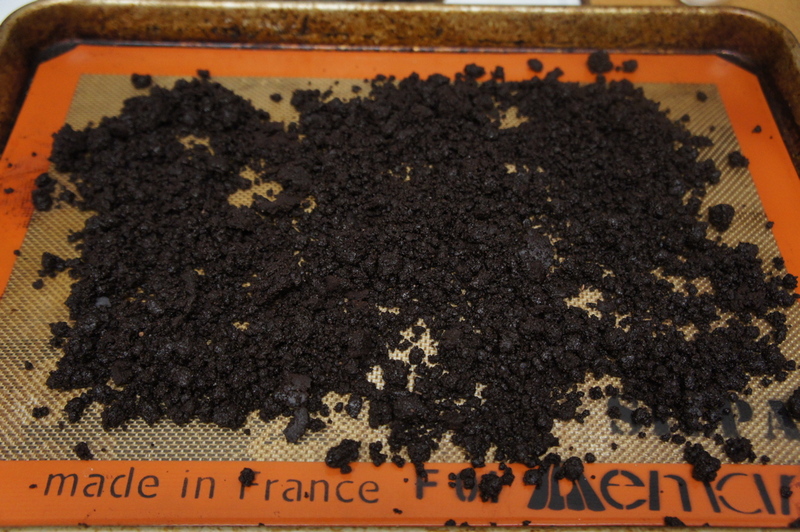 Instead of refined carbohydrates from the flour, you get fiber and protein from the black beans. 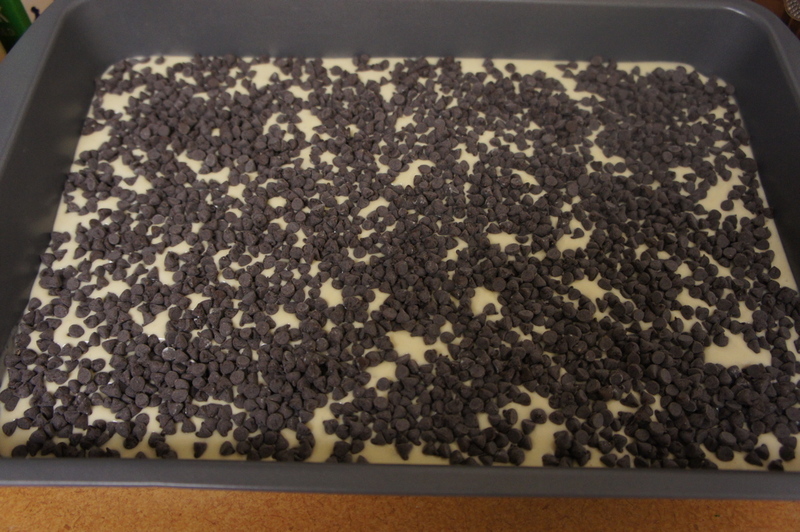 The black beans are mashed and then mixed with eggs, vanilla, canola oil, cocoa powder, baking powder, and chocolate chips. The brownies turn out fudgy, moist and chocolatey, and the surprising thing is that no one can taste the black beans! I followed one commenter’s suggestion and lined the bottom of my baking dish with parchment paper, which helped prevent sticking. Who knew that gluten-free black bean brownies would taste good and be good for you? I first saw this recipe on Baker on the Rise’s amazing blog. Link to recipe here. One of my favorite dishes in Vietnamese restaurants is a cold rice noodle bowl, topped with grilled meats, crispy spring roll, vegetables, and fresh herbs, all tied together with a pungent dipping sauce. This recipe from David Tanis writing in The New York Times, is a healthy, delicious take on this dish that is great for a summer meal. There is grilled chicken marinated in garlic, ginger, lemongrass, brown sugar, fish sauce, and soy sauce. Vegetables include cucumbers, carrots, and mung bean sprouts. There are fresh herbs – cilantro, basil, and mint. To top things off there are crunchy peanuts and two sauces – a dipping sauce made from fish sauce, garlic, chiles, sugar, and lime, and a peanut sauce made with peanut butter, fish sauce, soy sauce, sesame oil, and ginger. 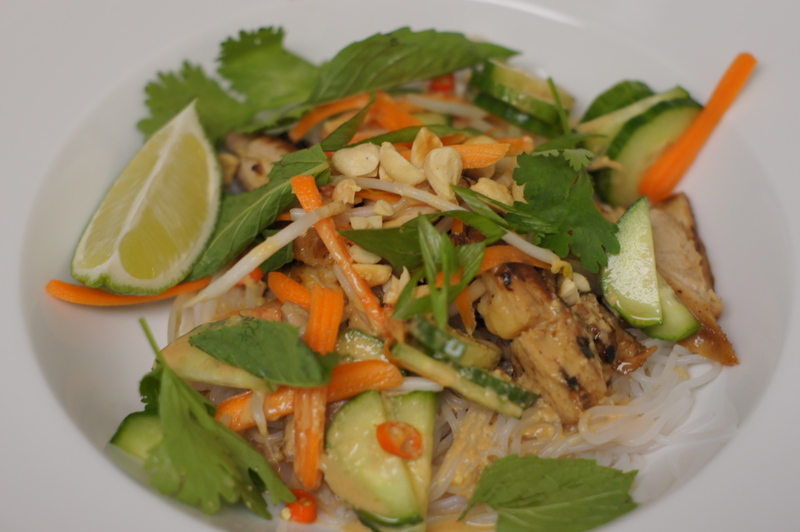 The peanut sauce is great and differentiates Tanis’ dish from traditional Vietnamese rice noodle bowl. This dish is light and fresh, and there is a lot of flavor. The recipe requires a lot of specialty ingredients that can be sourced at an Asian market. There are a lot of individual components (chicken marinade, dipping sauce, peanut sauce) but nothing too difficult. Total time to make was almost two hours. Be careful with the Thai chiles, because they are tiny but pack a lot of heat! Bon Appetit website has several recipes from Danny Bowien, chef of Mission Chinese Food in San Francisco and New York City. 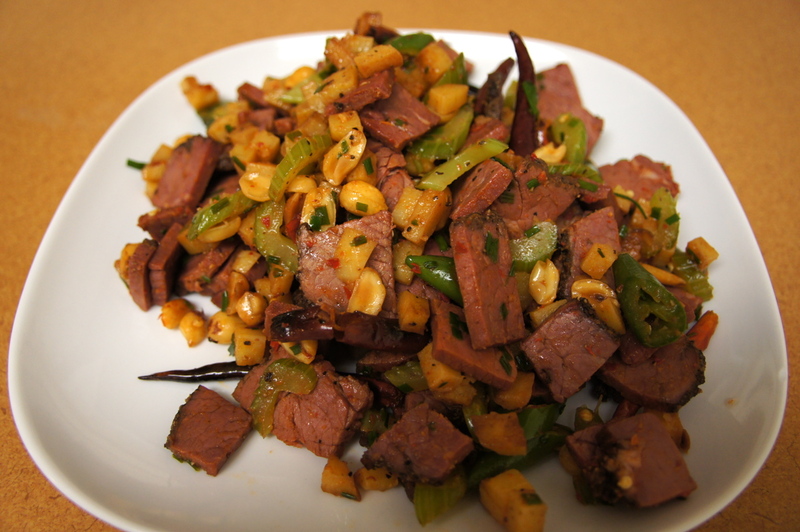 Kung Pao Pastrami is one of my favorite dishes at Mission Chinese Food, so I was excited to see the recipe. Chef Bowien uses some decidedly non-Chinese ingredients, like potatoes and pastrami, to make an original, fiery, savory take on Kung Pao. Gratifyingly, the recipe allowed me to make a delicious version of the dish that is very close to the one served at MCF, albeit without the house-made pastrami at MCF. There are a few specialty ingredients to track down. I found broad bean paste and Szechuan peppercorns at an Asian supermarket, and Safeway had red jalepeno peppers and serrano chiles. There is a sub-recipe for salted chili paste, which is made from ten raw red jalepenos, ten dried chiles de arbol, fish sauce, salt, wine, ten raw garlic cloves, and ginger. It is really pungent. One complaint is that the recipe makes about a cup of salted chili paste, but the Kung Pao Pastrami recipe only needs one tablespoon. After the salted chili paste is made, the rest is pretty easy. The recipe calls for first frying some diced potatoes in half cup of peanut oil, but I decreased the amount of oil to about 1-2 tablespoons. Then, stir fry the pastrami, celery, salted chili paste, chiles, peanuts, soy sauce, and broad bean paste and add some chives for garnish. There is a lot of explosive heat from the chiles de arbol, salted chile paste, serrano chiles, and szechuan peppercorns, and there is a lot of textural contrast with the pastrami, starchy potatoes, and crunchy celery and peanuts. I really liked this dish at MCF and can now make it at home! Link to my review of Mission Chinese Food here. Update: Because the recipe makes so much salted chili paste, I tried to think of ways to use it by modifying the Kung Pao Pastrami recipe. 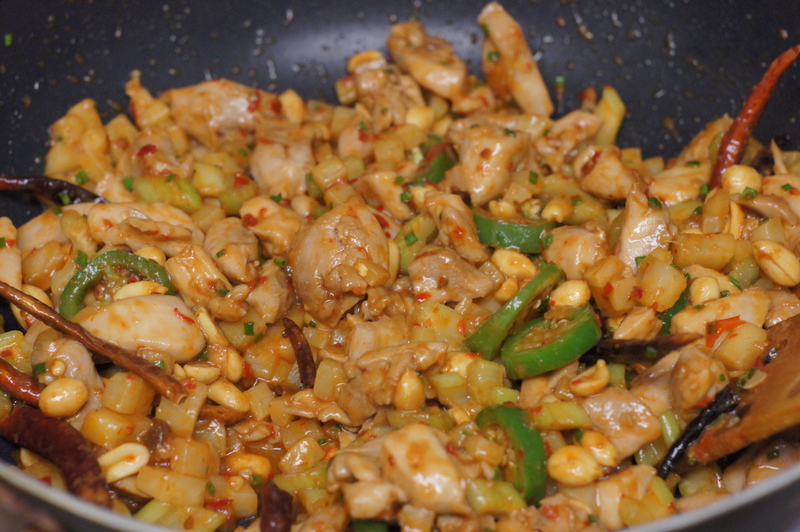 Then it hit me – I’ll make Kung Pao…Chicken! Danny Bowien’s recipe makes a great Kung Pao Chicken, with less fat than pastrami. Mix first three ingredients into a slurry and marinate chicken thigh pieces for 20 minutes. Follow the directions in the Kung Pao Pastrami recipe. After cooking the potatoes and transferring to a plate, add dried chiles to hot oil and then stir fry chicken until cooked through, then continue following the Kung Pao Pastrami recipe. 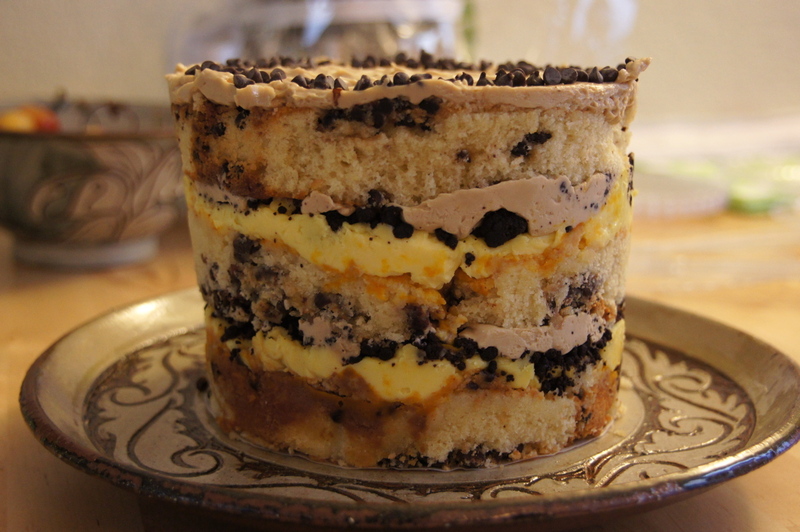 This cake from the Momofuku Milk Bar cookbook is another of Christina Tosi’s delicious multi-component layer cakes, made from a chocolate chip vanilla cake, passion fruit curd, chocolate crumbs, and coffee frosting. In the book she tells the story of how this was a birthday cake for David Chang, and it was a huge hit in the Momofuku kitchens. This cake was easier to make than the Carrot Layer Cake, probably because I had been through the madness of making that cake and knew what to expect. 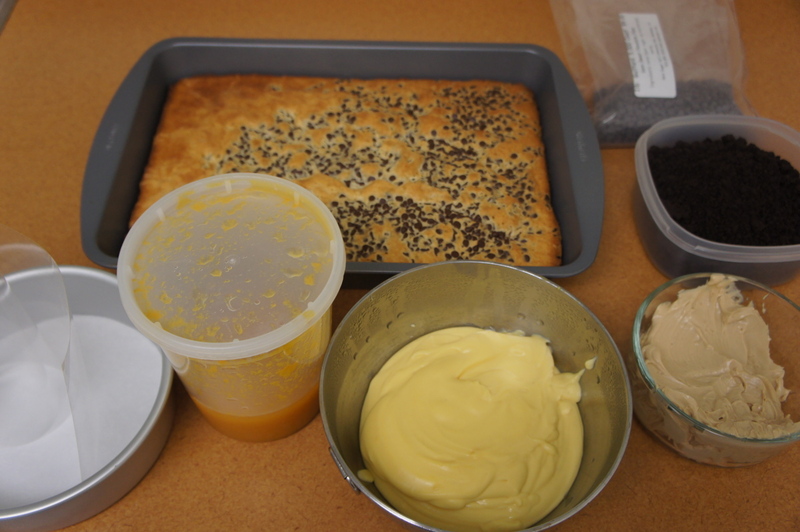 It takes some advance planning, because the cake, chocolate crumbs, and passion fruit curd need to be cooked and cooled before final assembly, but is doable for the home baker. 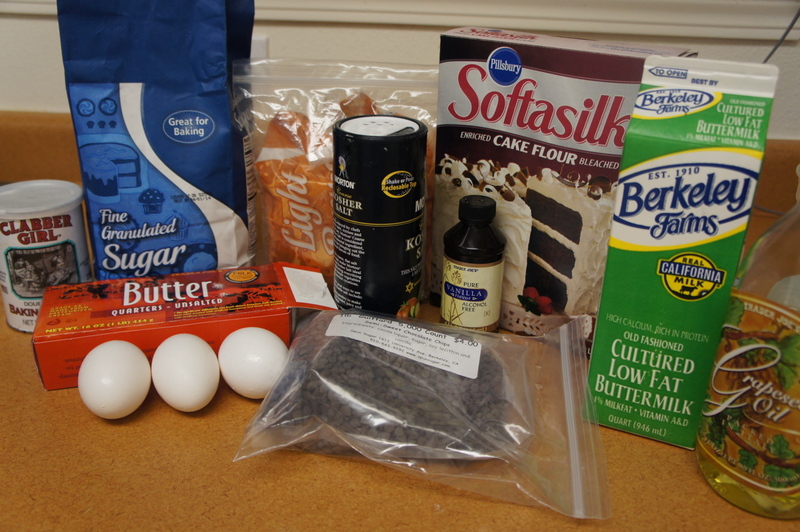 The vanilla cake batter is made from sugar, brown sugar, butter, eggs, buttermilk, grapeseed oil, vanilla, cake flour, baking powder, and salt. 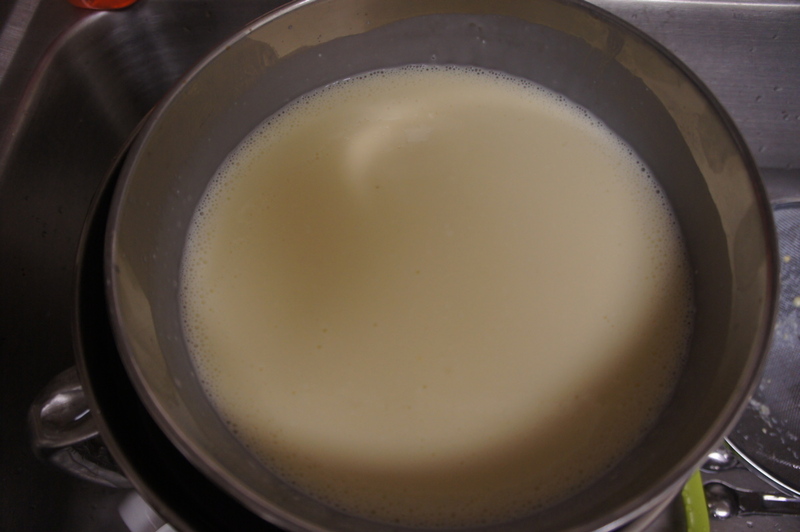 The batter needs to be whipped for a long time in a stand mixer to homogenize all of the liquid and fat components, longer than the suggested times in the book. The chocolate crumb is pretty easy and is made from Valrhona cocoa powder, sugar, flour, cornstarch, salt, and butter that are mixed together into a crumble and baked. The passion fruit curd is made from passion fruit puree, sugar, and eggs that are blended together and then heated over low heat to thicken. 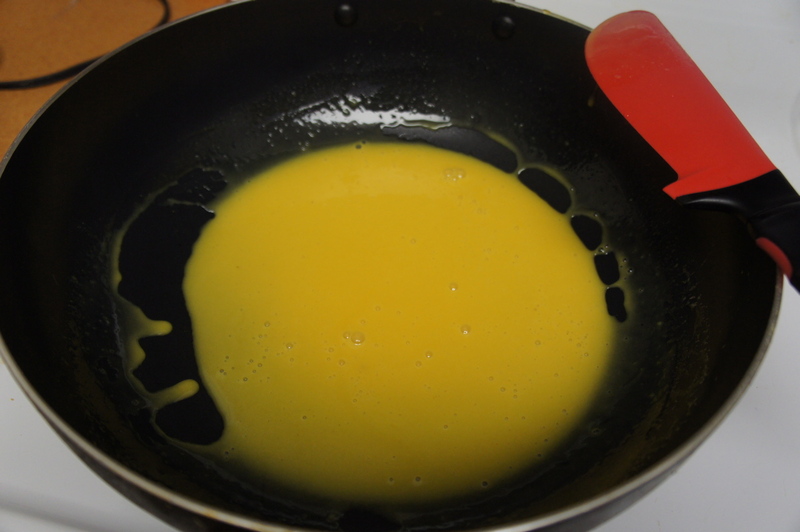 This mixture must be stirred constantly to prevent the eggs from cooking, so the constant monitoring and low heat make it a bit of a pain. 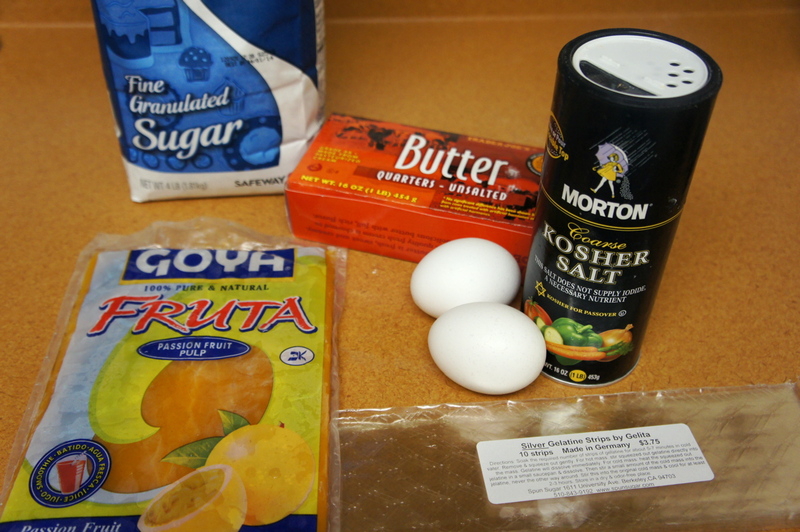 Once the mixture boils, it is poured back in the blender and blended with gelatin and butter to make a rich, tart filling for the cake. 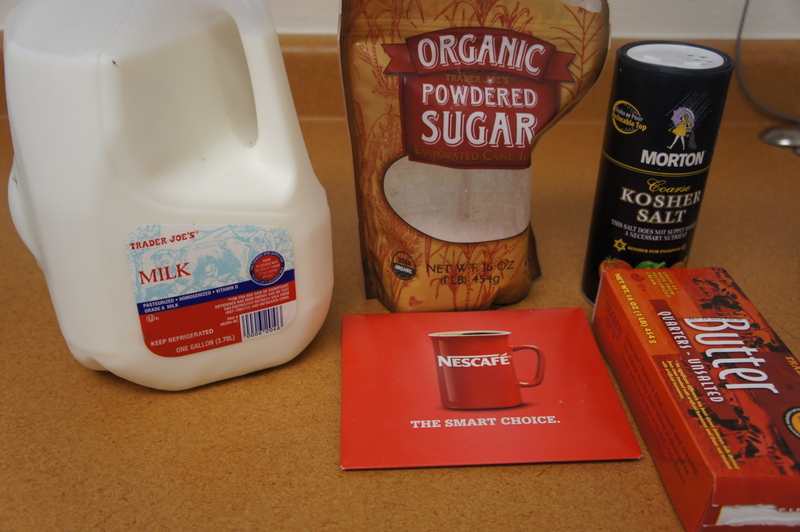 The coffee frosting is made from butter, powdered sugar, Nescafe instant coffee, salt, and milk and is pretty straightforward. 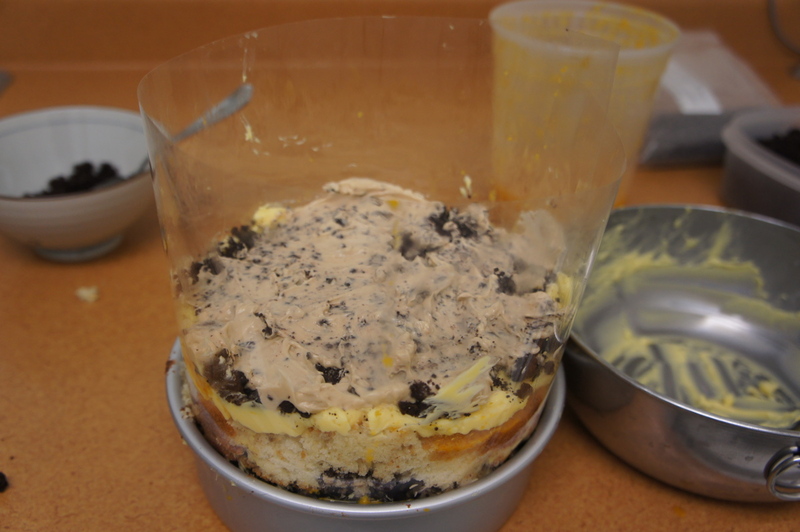 To assemble, I used a 6″ x 20″ strip of acetate to line the sides of a 6″ cake pan. 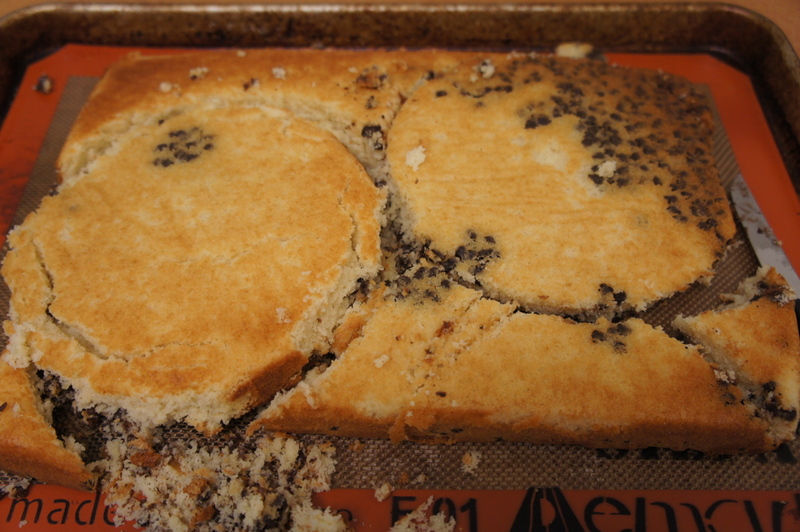 The chocolate chip cake is cut into two 6″ rounds, and the rest of the scraps are smushed together to form the bottom layer of the cake. 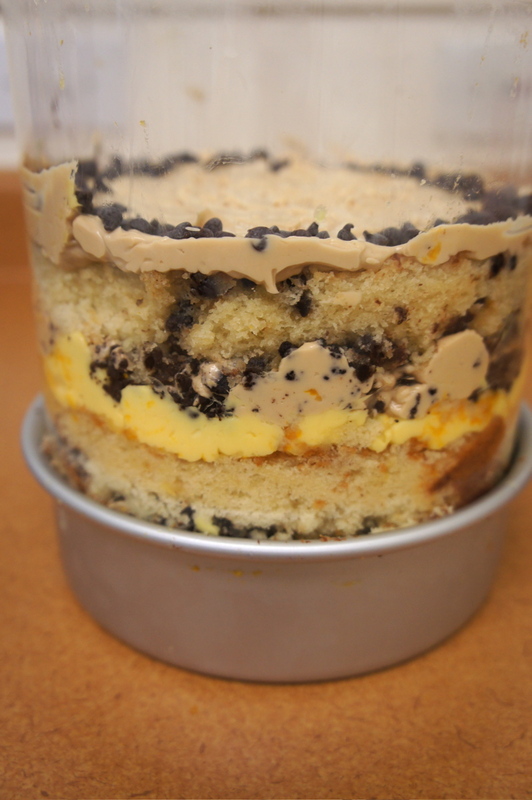 The cake is soaked with some passion fruit puree, then topped with passion fruit curd, chocolate crumb, coffee frosting. This is then repeated with the second cake round. The final cake round goes on top, which is then topped with coffee frosting. Finally, the entire assembly is frozen overnight and thawed a few hours before serving. 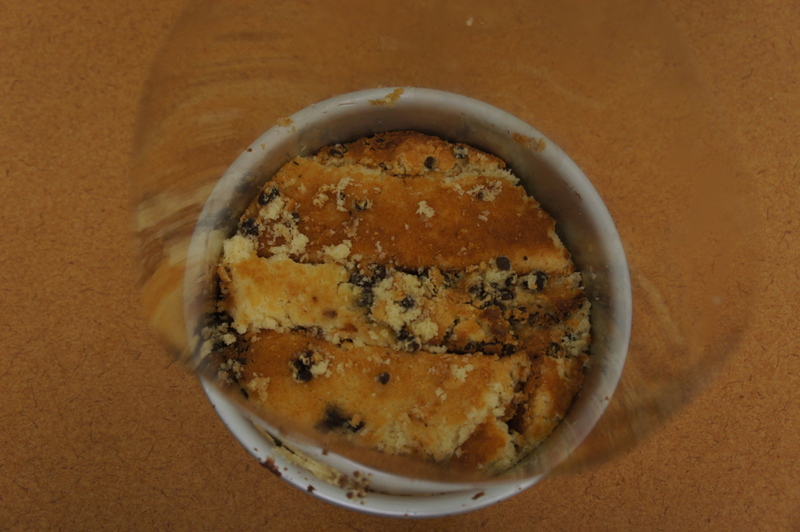 Verdict: the chocolate chip cake was really good, and its sweetness was balanced by the tartness of the passionfruit curd. 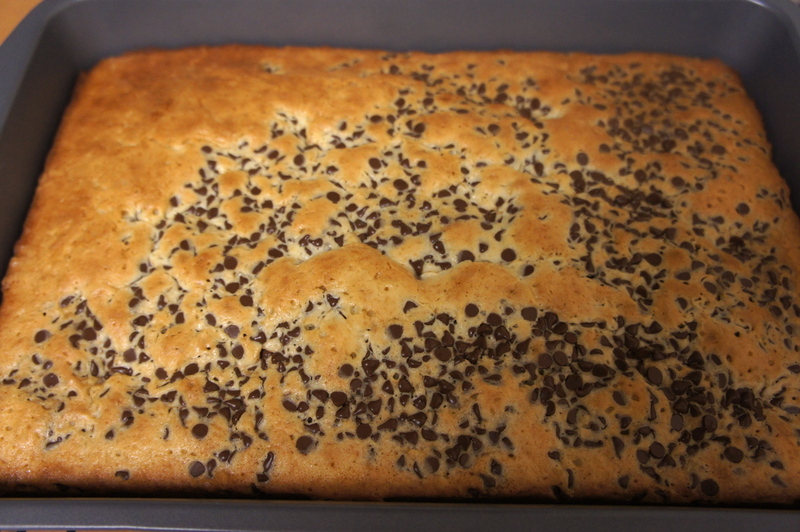 The chocolate crumb added bits of intense chocolate crunch, and the coffee frosting was really buttery with a subtle coffee flavor. A delicious, impressive cake for guests. Amazon link to Momofuku Milk Bar cookbook here.